(Bloomberg) -- South African mining stocks have had their best start to the year since 2016 and there’s every chance they are not done yet. The FTSE/JSE Africa Mining Index has gained 22 percent as of April 16 and is close to an eight-year high, helping South Africa’s benchmark gauge advance 12 percent as investors show few signs of nerves before elections on May 8. The benefits of iron-ore supply disruptions from Brazil to Australia that have crimped shipments and driven prices to the highest since 2014 are clear to see: Kumba Iron Ore Ltd. has jumped 67 percent this year and is among the main index’s biggest winners. The financial windfall for companies from rising commodity prices looks set to preserve the sector’s allure for investors, said Matthew Shields, an analyst at Avior Capital Markets Ltd. in Johannesburg. The mining index dropped 1.9 percent as of 4:19 p.m. Wednesday as iron-ore prices fell amid alleviated supply concerns. Should the tailwind from prices for the steelmaking ingredient that have risen by about a third this year begin to fade, there are other products extracted from South African mines that could fill the breach. Battered thermal coal, which this month dropped to the lowest price since 2017 for benchmark Australian exports, may be poised for better days as demand returns. “We believe thermal coal prices have approached a floor and should recover towards the end of the year, providing support for mining counters,’’ Shields said. 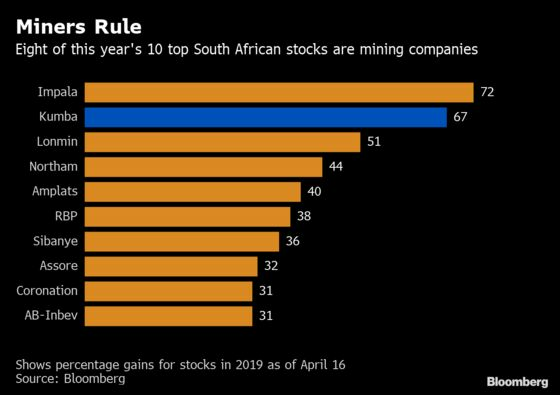 Eight of the 10 best-performing stock in South Africa’s benchmark index this year are miners, with platinum and palladium producers prominent as prices of the metals surge. Positive signals from the Chinese economy and optimism that talks the world’s biggest consumer of metals is holding on trade with the U.S. will lead to agreement are also driving commodity prices and Johannesburg mining shares higher. 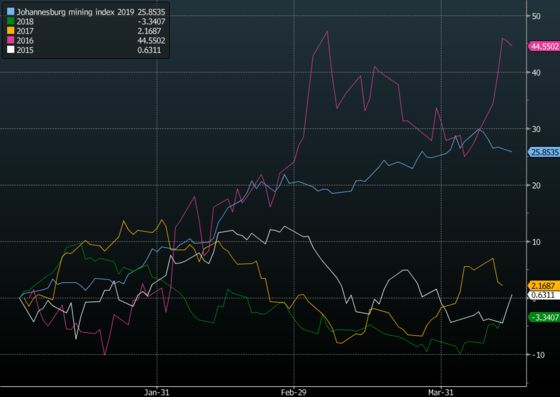 South African stocks are three weeks away from confronting the biggest risk event of the year -- next month’s elections, which hold the potential for causing volatility in the rand. Domestic mining companies are highly sensitive to movements in the currency and a sharp depreciation would have the greatest effect on smaller producers, Shields said.